This is a good thing — to be in uncharted territory — isn’t it? It seems that I have been weaving warp-facd structures for such a long time that I had rather forgotten about weft. Weft? That thing that holds the cloth together? Well apparently sometimes you can actually see it too, such as when you are weaving lacy structures with weft floats. Surprise! I started weaving a little sample piece at the beginning of the serious warp, and didn’t like what I was seeing on the loom at all. First I realised that I was beating too hard so had to relax and proceed more gently. 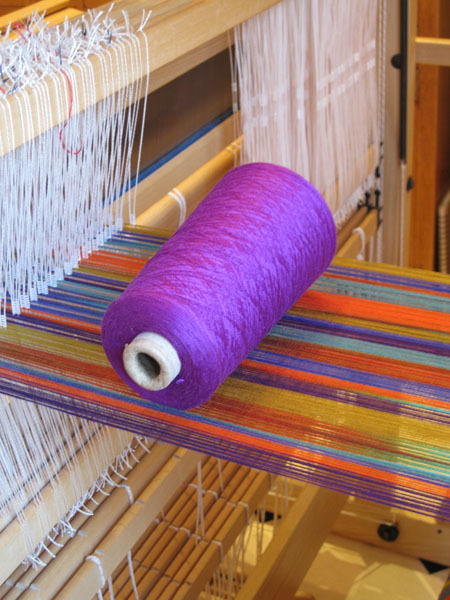 But even a more open weave seemed to be much more, well, weft-coloured than I was expecting. I tried a couple of different colours, then an alternative yarn — some gentian silk (leftover from my trousers) which is a bit finer than the warp yarn — then I decided I had better cut it off and wash it before I got too depressed. That was a good decision. Washed and very firmly pressed under a wet cloth, even this scrappy little sample is much more appealing. The warp floats have made their way to the surface, much to my relief, and so the colour is more balanced. Plus the lustre and drape of the silk make me do a little happy dance. …only the top third has holes of a sensible size — the lower part is much too dense. With the proper beat I think this would be quite appealing too, so for the moment I have decided that I don’t need to worry about buying more colours in the finer silk. My wallet says “Phew”. 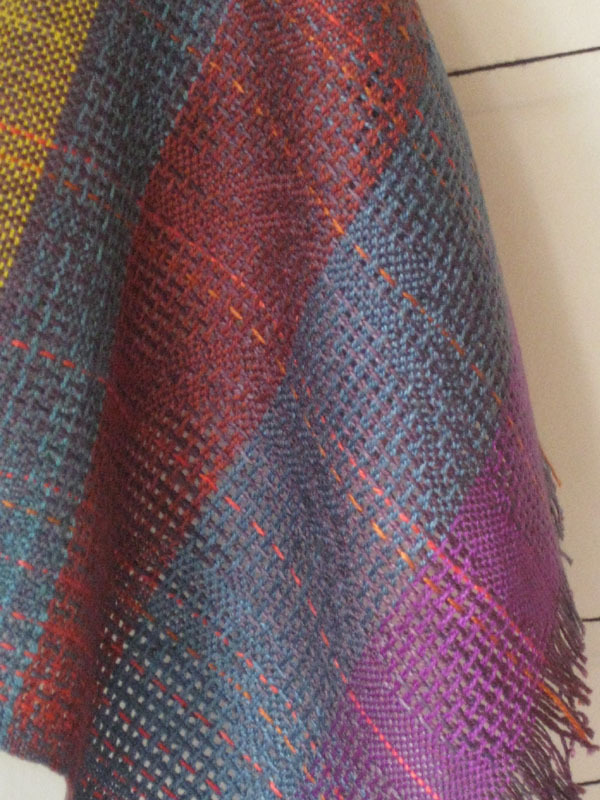 It just shows how important wet finishing is in weaving. Have fun with weaving this warp. I like your finished sample. you always leave me in awe with your sampling. i’m a blue person so the blue one seems like it to me. what will this be? a jacket lined in contrasting silk? Ooh, a jacket would be lovely, but no… planning to weave a variety of scarves — allows to me to look as though I’m making real things while actually sampling all the time!